A few days ago, I bought strawberries in our supermarket. 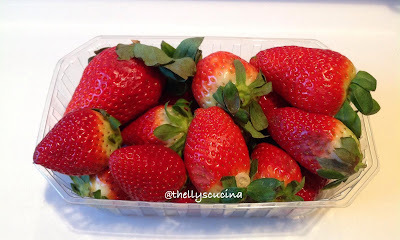 It is not a season for strawberries but they are sold in some of our supermarkets nearby and they came from Spain. During summer time, I harvested strawberries in a strawberry farm open for the public and froze the fruits for later use. Here is a link to how to store and freeze strawberries. Anyway, when I saw the strawberries, my mouth was watering and so I bought a package of strawberries which is 500 grams in weight. Of course, I was not planning to eat them at once. The leftover would be still good for the next day. So I thought. When I arrived home from food shopping, I tasted 1 piece of strawberry after washing all of the fruits in a strainer. I was disappointed as it was not tasty at all. I tried another one but still the same. It was and still is always hard for me to throw food in the bin and so I was thinking of how I could make the strawberries tasty. 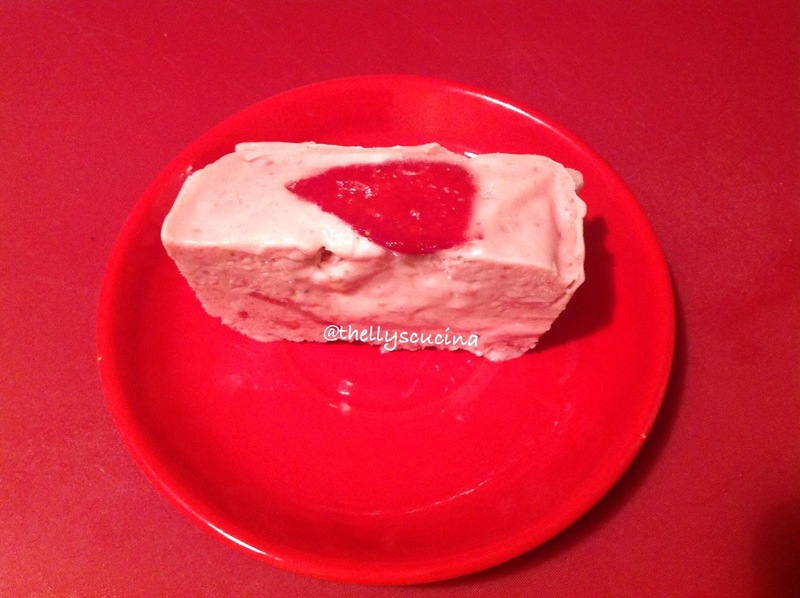 Once again I was searching in my fridge for something I could add to the strawberries as I was thinking of making an ice cream. Lo and behold, I found an open can of coconut cream and a leftover of my sleeping drink, condensed milk. 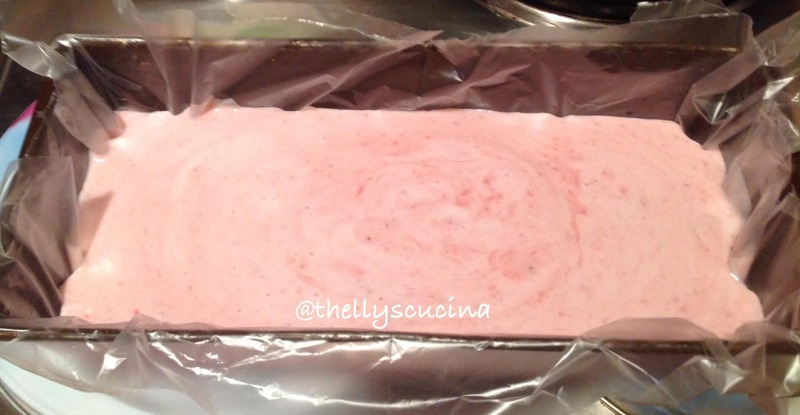 You need a baking tin, aluminum foil and 2 cellophane for freezing the ice cream. 1. Hull and wash the strawberries. Slice them into small pieces as seen in the photo above. Leave a few slices for decorating the strawberry coconut ice cream. 2. Put the sliced strawberries in the smoothie maker or blender and make a puree. 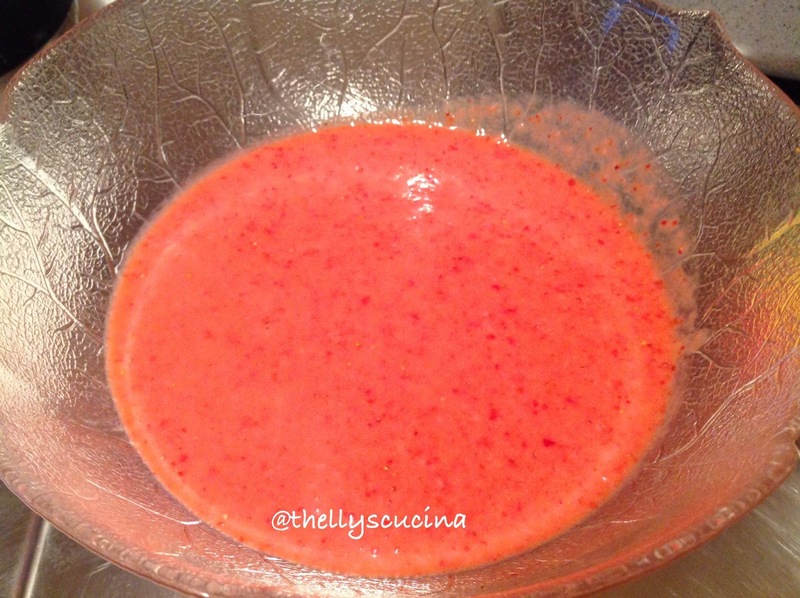 Then put the strawberry puree in a bowl. 3. 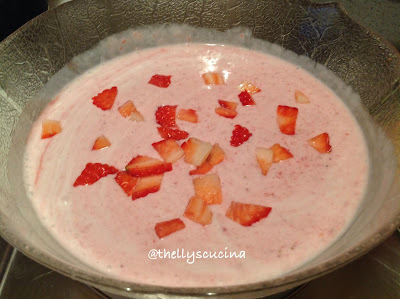 Blend the coconut cream or milk and the condensed milk together with an electric mixer until creamy. Add honey if you wish. 4. 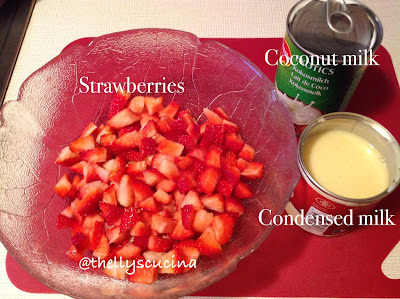 Add the coconut mixture to the bowl of strawberries and add a few strawberry slices. Mix them well with a spoon. 5. 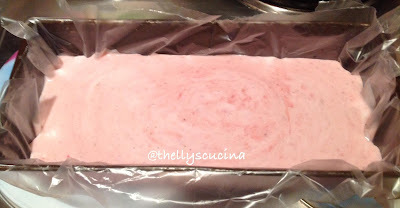 Put a cellophane in the baking tin and pour the coconut ice cream mixture. Decorate the top with strawberry slices. 6. 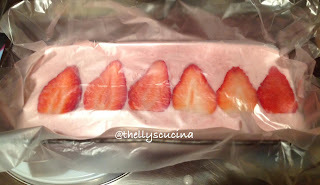 Put another cellophane on top and press it a bit to get the air out. Cover it with aluminum foil. Freeze for at least 4 hours or overnight for a better result. 7. 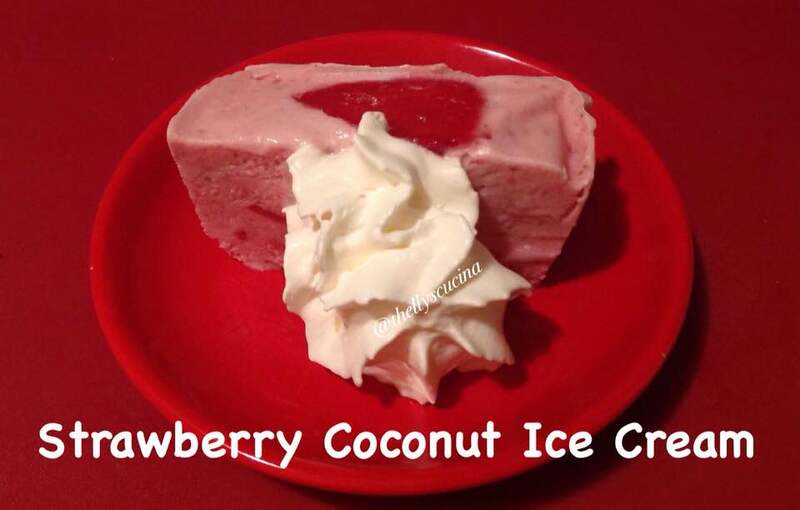 Before serving, get off the strawberry coconut ice cream from the fridge and let it rest for about 10-15 minutes. Pull the cellophane with ice cream from the baking tin. Now you can slice the ice cream into a size you want. 8. 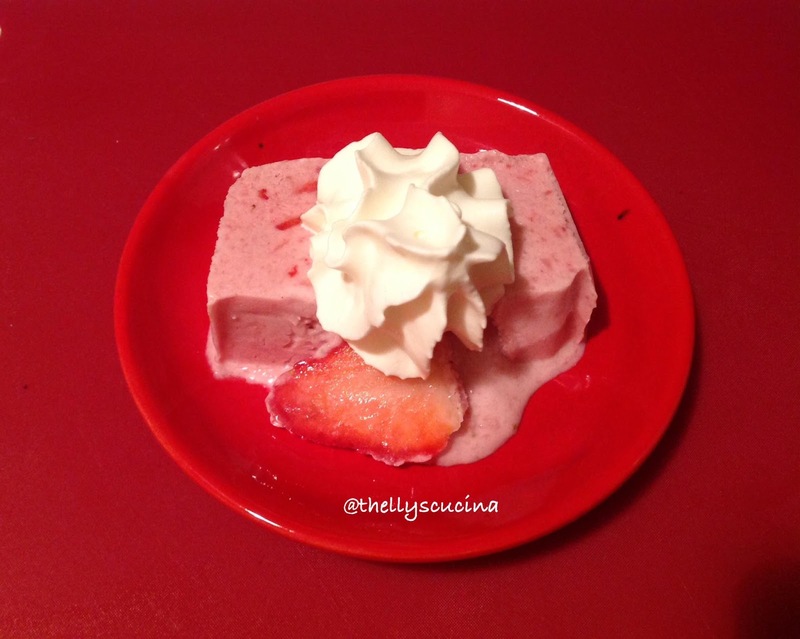 Enjoy this strawberry coconut ice cream with a dollop of double cream. Thanks for reading my blog. 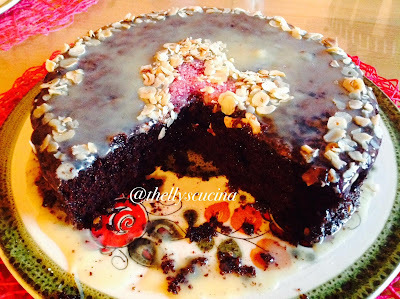 Please feel free to comment, like and share this recipe to your social media sites. Ciao! Hi Eugene. Me, too. Strawberries are just yummy. Thanks for dropping by. Have a lovely weekend. Hi Carol. Sorry for the late reply. Yes, you can make this with pineapple. Enjoy making. Thanks for dropping by. Looks and sounds so yummy Thelma but know we would demolish it all in one go and the waistline would not thank me!! Love it though so as a treat may just do it when my strawberries back next year!! I can relate to that Susie that's why I usually make this ice cream when I have companions in eating. Thanks for dropping by and sorry for the late reply.